I had a meeting with Suzanne Kasler this week. Her office is filled to the brim with beautiful design books, and she has the most amazing reference library. Given that we are in the season of gift giving, I asked Suzanne as well as Keith Arnold, VP of Suzanne Kasler Interiors, to name their favorite design books. These are the books that first came to mind for Suzanne and Keith. 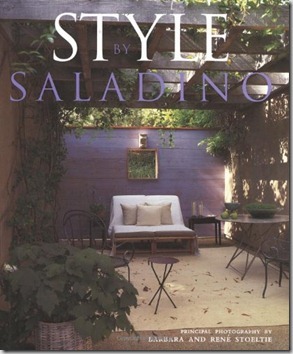 Style, by John Saladino. This is one of Suzanne’s ‘go-to’ books for inspiration. Purchase on Amazon here. Axel Vervoordt, Timeless Interiors – purchase on Amazon here. Michael S. Smith – Elements of Style. One of the all time great books of interior design. Purchase on Amazon here. Suzanne also loves this book by Jacques Grange – I have seen this out on her desk many times. Purchase on Amazon here. Over the course of the project, Suzanne has also referenced Vogue: Houses, Gardens, People as one of her sources of inspiration – one of the best books that epitomizes the stylish life. Purchase on Amazon here. Dwellings, by Stephen Sills and James Huniford. Purchase on Amazon here. The Private House, by Rose Tarlow. Purchase on Amazon here. 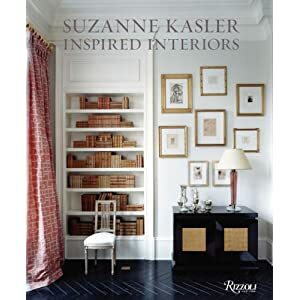 Of course, Suzanne has written an amazing book on her approach to interior design, and it is definitely one of my all time favorite books. Purchase on Amazon here. Blog readers often ask me about my favorite architecture and design books. I love books; in recent years, they have become my favorite Christmas gift to give and receive, and I enjoy spending the afternoon of Christmas day looking through and reading books. I have gathered together all of my favorite architecture, design, and art books in one place – the Things That Inspire Amazon store. Click here to visit it, or go to http://astore.amazon.com/thithains-20. I have also posted about my favorite architecture books here. I have a few special recommendations that would be perfect gifts for the holiday season. There are some books that I love for their decorative quality, as well as their literary quality. I have been slowly but surely collecting the beautifully designed clothbound volumes from the Penguin Classics. This is one of the newest books in the collection – Sonnets by Williams Shakespeare. Available from Amazon here. Also new in the collection of Penguin Classics is Little Women. I love the cover! Can't you just imagine Jo taking the scissors to 'her only beauty' when you see these scissors? Available from Amazon here. This little gem would make the perfect hostess gift for a holiday party. It’s not too late to order! Available from Amazon here. New to my book list are several excellent books that came out this fall. Peter Pennoyer Architects: Apartments, Townhouses, Country Houses. This book is full of exquisite town and country homes, with the thoughts of the architect behind the beautiful work. I appreciate the beautifully rendered floorplans that are included with each project; it gives me a whole new level of appreciation for the work. Also of note is that Pennoyer works with some of the best designers in the industry, resulting in spaces that are not only architecturally stunning but also decorated with great beauty. Click here to purchase on Amazon. French Country Style at Home, by Sébastien Siraudeau. Take a trip into the real country homes of France, and be inspired by beautiful and charming examples of true French country style. I love the variety of homes shown in this book – from the grand to the simple. Click here to purchase on Amazon. The Irish Country House. A beautiful book full of homes that most of us would never see if not for the carefully collected images in this book. The homes in this book speak to generations of families who love their homes, with interiors that have evolved over decades and even millenium. Click here to purchase on Amazon. The Home Within Us, by Bobby McAlpine. Although this book was published in the spring, I only recently purchased it. I am not sure why I waited so long, because I have already referenced this book many times in the course of seeing my own home spring from the ground. To paraphrase a concept that McAlpine mentioned in the book, he noted that some people have a home that is within them, and no pre-built home will ever fulfill them like building one from scratch. This perfectly captures the reason why I looked for a house for over a decade and could never find one that was ‘me’ (and the home that we are building is very much a reflection of my husband and me). I love that this book talks about the narrative of many of the houses, why they were built, what the owners and the architect were trying to achieve emotionally and physically by building the house. Fascinating stuff. Click here to purchase on Amazon. The Architecture of Happiness, by Alain De Botton. A friend recommended this book – she said it was perfect for me, as it is about how architecture influences our lives and reflects our dreams, hopes, and desires. The review says this book opens up our eyes and really look at the buildings in which we live and work. Click here to purchase on Amazon. At Home, by Bill Bryson. This book was selected as Amazon’s best book of the month for October 2010, and it looks fascinating. It is based on a reflection on Bryson’s own home, a Church of England rectory built in the 19th century; Bryson reconstructs a history of the home room by room, and how the home and the objects within it (which have changed greatly over the centuries) have impacted both the architecture and the inhabitants. Click here to purchase on Amazon. The Bill Bryson book is fabulous. I highly recommend. Thanks. Peter Pennoyer was just in Atlanta to promote "Architects: Apartments, Townhouses, Country Houses." Thank you. Just got an idea for the most difficult person on my list. The thought of a design reference library sounds amazing! I have the Vogue book - the photography is fabulous. That Peter Penoyer book looks awesome - great photo on the cover! What a fantastic list. Books are always one of my favorite gifts to give and receive. First off....how great is it that you get to sit, visit and work with Suzanne Kasler?! Next, love this great list of books. I am always adding to this category in my own home and love giving them as gifts. This week I met Alexa Hampton and had her sign a copy of her new book to give away....ends Sunday. Wow, I am going to need to bookmark this post for my own personal wishlist! Fabulous!! I love giving beautiful books at Xmas and you've got a great roundup here (and how clever of you to ask two fabulous designers to share their favorites as well!). I too love the Pengiun classics; just picked up the Sonnets collection for my own library. The Architecture of Happiness is a treasure! What a fun post! So fun to peak into the mind of one of my favorite designers. Wonderful list - already have several of these and love them! Books are a weakness of mine and am already overflowing at the seams - have to figure out some more storage solutions - bookshelves in the bathroom perhaps?! Some of these are on my list to buy... Would love Bill Bryson's. I am ashamed to say (am a complete book junky) that i have every design book mentioned! and John Saladino is on top of my list. His last book photographed by my friend Antoine Bootz is all about his house and is such a wonderful read. i have bookshelves in almost every room...library, bedrooms, hallways, dining room, Living room, family room, kitchen and i now bring the overflow to my showroom. i think am in need of serious help! A great list! I can hardly wait to see the new book of one if my favorite authors featured here, the Knight of Glin! Design books are my weakness. I can never have enough design or art books.. It is definitely a fool proof gift guide for me. I simply cannot get enough design books on my bookshelf, so this post was just fabulous! I especially LOVE Suzanne Kasler's book, and Vogue Living is such a wonderful, "beefy" choice for a coffee table book! I would love that irish country house book! I am obsessed with gorgeous design books and this is a wonderful collection...thanks for sharing! Those are some great looking books, I may have to add a couple to my wishlist! Books always make the BEST gifts! Perfect size and always the right color. I see a few I need to get my hands on.